I don’t really have any business doing this race. Last year I was in really good shape and weighed less than I did in college. I was riding hard each week with the crew at Mellow Johnny’s, I’d gotten used to riding long distances, and I was putting in miles whenever I could. I saw the race on the calendar and decided I would do it. I was talking about it with one of the women who rode on the MJ’s ride after I’d decided to give it a shot. She was a sponsored mountain-bike racer who dabbled in riding on the road – she said she’d ridden it before and it was the hardest thing she’d ever done. Then I crashed while training on the road. I wasn’t hurt very badly, but it was enough to take the wind out of my sails. 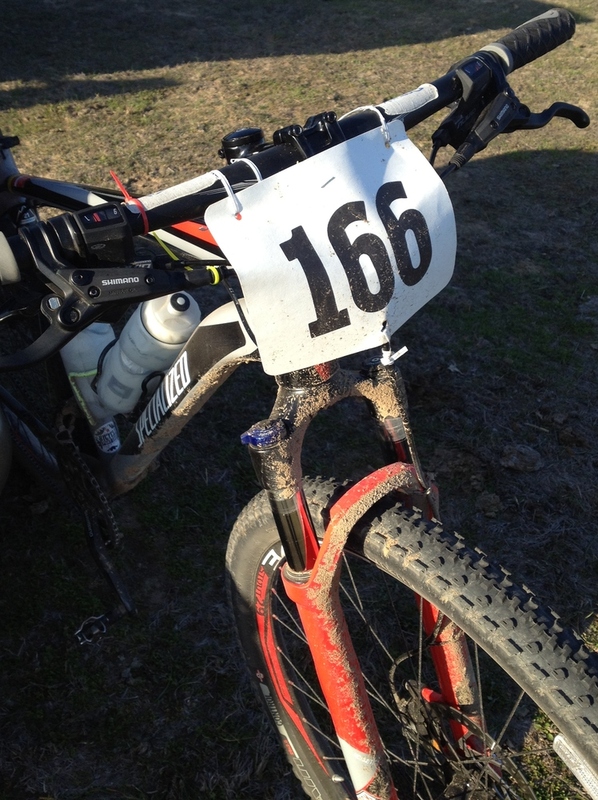 I used it as an excuse to pull out of the race, and I didn’t ride much at all for a few weeks afterwards. I’d been kicking myself about that all year. This year I’ve continued to put in miles, but over the summer I started getting slower (and heavier) and I didn’t ride my mountain bike at all. 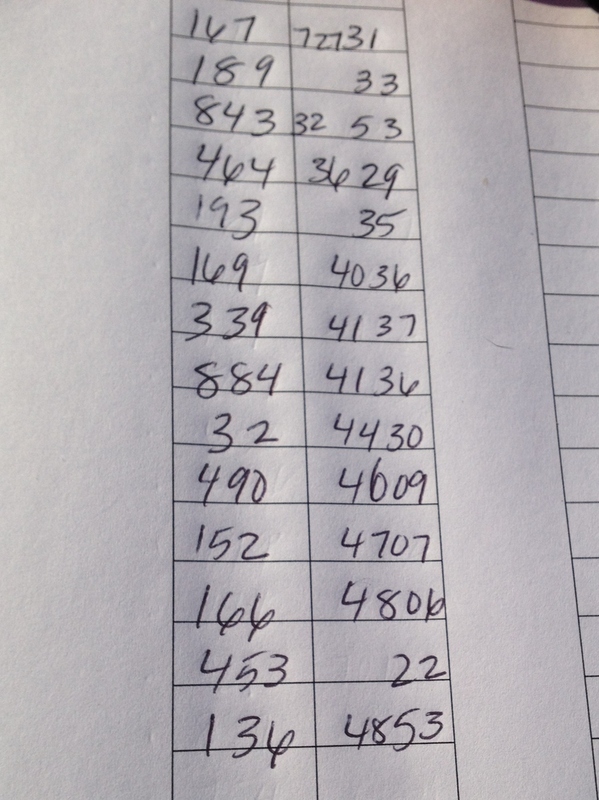 I kept putting on weight into the winter and after October my mileage dried up a lot. In December I saw the Excruciation Exam on the calendar and decided that I’d line up and give it a go. I was inspired in part by my friend Janeen McCrae, a writer and cyclist I’d first heard about when she was riding across the country. She’d participated in a road racing series in Central Park this summer, her first time racing on the bike. She was having to race with state and national champions, people much faster and experienced than she, and so she had to find ways to make victories for herself. The most important one, I imagine she would say, was choosing to line up. I’d also learned a lot reading the Fat Cyclist’s blog, and his book, Comedian Mastermind, picking up tips on how to succeed at endurance biking events between the “jokes” and his legal entanglements with professional cyclists. My goal was simply to finish within the time allowed. I figured I had enough base fitness and adequate experience on the trails that if I rode smart, and was careful with my nutrition and hydration, I could probably do it. I paid my $65 registration fee the week before the race and started telling everyone I was going to do it. I made a list of all the things I would need, including a suitable bike. For this race I’d need something that was suited to both riding on the road and the trails. I rented a Specialized Carve, picking it up from the shop the afternoon before the race. I rode about 8 miles on it getting home from work, trying to get a feel for it and figure out if there were any surprises, but it was plenty comfortable and everything seemed to work just fine for me. I’d never ridden a 29’er before but I was looking forward to seeing how it worked on the trail and hoped it would feel kind of like my road bike when the course hit the highways and dirt roads between Warda and Smithville. I made a huge checklist of things to pack and take with me, got everything ready the night before, and then tried to get some sleep before the 4AM wake-up the day of the race. The weather forecast for race day called for mostly sunny skies with a morning low of around 45 and a high near 70. When I woke up and let the dog out at 4AM the temps were closer to 60, with pea-soup fog. I grabbed a couple of diet Cokes and made two PB&J sandwiches for the hour-long drive out east to Warda, loaded my bike on the rack and the bags I’d packed the night before, and headed out. Thanks to my checklist I only forgot my floor pump. The thick fog made the drive slower and more harrowing than normal, but it did help keep me awake and alert. A little before 6 I pulled into the Bluff Creek Ranch campground where the race was to start, the first person to arrive who hadn’t camped there overnight. There were so few cars and campers in the lot that at first that I was afraid this was going to be a tiny field. Since my primary race strategy was to find as many slow and out of shape people to hang with as possible this was somewhat of a concern. Getting dropped right off the bat by a small group of elite riders wasn’t part of my mental preparation. Fortunately more cars started to arrive as the minutes ticked by and by the time the sun was up enough to see through the fog there were nearly 200 riders getting ready to go. I got signed in, got a one day license for the race, then prepped my bike and the bag of spare food and drinks that was going to be dropped off at the support area in Smithville. I said hello to folks and tried to figure out who I might be able to keep up with once we got past the single-track section in Warda and headed out on the roads. I also tried to pick up advice from people who’d ridden the race, or sections of it, before. By a show of hands at the racer’s meeting before the start the field was roughly 50/50 between previous participants and newbies. The race starts with an 8.5 mile section of single track, which I was told by the folks who’d done the race before would be crowded and slow as the field was stacked up at the start. I’d ridden a race here two years ago so I knew what to expect once on course. There are a few short, tricky descents, lots of roots on the sandy, tight trail through the woods, but nothing scary or especially hard. After the trail ends you head out for 30-ish miles of road and dirt road west to Smithville. Once you reach Smithville the course goes back onto the trails for a little over 20 miles of trail at Rocky Hill Ranch. I’d never ridden here and didn’t know what to expect, except from hearing from some of my riding buddies who’d been there once that it was surprisingly difficult with more climbing than you’d expect given the surroundings. After that was done the course went back on a different set of mostly dirt roads for 20-odd miles back to Warda, where there was another mile of single-track at the finish. I only had a simple heart rate monitor and didn’t bother with a computer to track time and distance, or even a watch to track the time. I’d use my HR as governor to make sure I didn’t go too hard and burn up early. Otherwise it would just be pedal, pedal, pedal, and follow everyone else until I crossed the finish. The fog didn’t lift as the sun came up. If anything it seemed to get thicker and the morning air was wet and cool. Race officials announced that they’d decided to push the start back by 15 minutes in the hopes that it would clear up a little bit before we went out onto the roads. The roads were all open to traffic and they didn’t want any of the racers to get run over. The 2:30 cutoff for leaving Smithville, to ensure that everyone would make it back before dark, remained unchanged however. I was concerned about making that cut so the delay at the start made me nervous. The race, amusingly, had a Le Mans start. We laid our bikes along the trail on the far side of a barn, and then walked back 1/8 of a mile to the starting line. When the horn sounded we all took off running, back down the drive and through the barn, then picked up our bikes and hit the trail. They do the start this way to try to spread out the group at the start so that people don’t have to walk their way down the initial parts of the single track. It kind of works, but the opening few miles of the race were more like a neutral start for those of us toward the back of the pack. I was glad for it because it gave me a chance to get comfortable and remember how to ride a mountain bike. I was doing fine, except my saddle bag unzipped itself twice and before I’d made it past the 3rd mile I’d lost most of what I’d need to fix a flat should I end up with one. With nothing to be done about it I pressed on and tried to keep from crashing myself or anyone else out. Since it is such a long race just about everyone was content to take it easy and just make it safely through the starting section. I made it to the end of the first trail section without any further incidents and was happy with how things were going as I left the ranch and headed down the road. In the pre-race meeting the officials had explained how the course was marked, and it was an exceptionally well prepared course. There were plenty of markers at each turn and intersection to keep you going in the right direction and they’d even painted markers on the road every 1/2 mile as well. That way, they said, if you were ever concerned that you’d gone off the course you only had to go a half a mile to know for sure. There was one checkpoint between Warda and Smithville which was said to be 20-ish miles after Warda. I found a comfortable gear and cadence and tried to spin smoothly on the big ring while keeping my heart rate between 160-165. On the road I’ve learned that if I can keep myself in this range I can ride there comfortably for as long as I need to. Since I didn’t have a computer or any experience on this bike I had no idea how fast I was going and I really didn’t care. As long as there were people around me I was confident I was going to be going fast enough to make the cut and the only thing I wanted to worry about was drinking and eating. 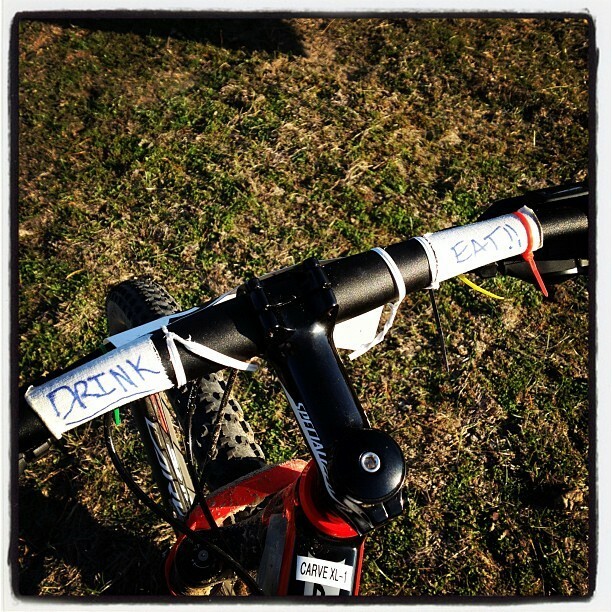 I’d made notes to myself to this effect and taped them to my handlebar. It helped to look down and see those reminders. It also helped that it was cool and foggy. I passed a few people in the first few road miles and then picked up a small pace line that was going at a good speed for me and I hung with them for a while. We were eventually passed by a slightly faster group of three riders and, predictably, my group sped up to join them. The change in pace was just enough to push me out of my conservative comfort zone, so I dropped off the group and rode by myself for a while. There wasn’t much wind and the course was basically flat so it didn’t really bother me to ride alone but it would have been faster to stay with the group. After a few more miles I picked up two riders and the three of us worked our way toward the first checkpoint. They warned me that the trail section in Smithville was challenging, but I tried to put it out of my mind and just focus on getting there with enough energy to get through it. Eventually, and it felt like forever, we rolled into the first checkpoint and rest stop. I topped off my water, dropped in some Nuun tablets, and grabbed a handful of peanut butter filled pretzels. As I rolled out I met up with a man I’d been talking to before the start. He’d done this race before and told me his strategy was to start off slowly so he wouldn’t have anyone on his wheel. As we rode away from the checkpoint he turned to me and said, “If I were a gambling man, I’d say that you’d be done with Rocky Hill by 1 o’clock.” Then he went a little bit ahead and I gave him plenty of room before falling in behind him. Hearing that gave me a big boost of confidence, even though I had no idea where I was on the course or what time it was to begin with. I kept him in sight the remainder of the way to Smithville and tried to make sure I stayed well hydrated and fed. I also tried to stay warm as the temperature had slowly fallen, and the fog remained thick, the whole time I was on the road. After turning onto the road that led to Rocky Hill I saw another racer who had already finished the second trail section and was headed back to Warda. I gave him a sincere salute, he gave me a little wave, and I wondered what it would be like to be that fast on a mountain bike. Shortly after that I made my way up a short climb and found myself at the top of a very steep hill. Racing down the hill my exhilaration was tempered by the thought that at some point in the future, after another 20 miles of trails, I was somehow going to have to climb that hill to get back to Warda. There was a second checkpoint at the entrance to the Rocky Hill Ranch (check out the .pdf Trail Map). There was also a support area, and I found my bag and stocked back up on food and got a good drink. I was excited to be feeling pretty good at this point and didn’t linger long at the checkpoint. I took off with half of a Honey Stinger waffle in my mouth, which I ended up having to spit out because the trails start off with enough of a climb that I couldn’t eat and ride at the same time. I’d been warned by two of the riders I’d ridden over with that the trail started with a fairly long sustained climb, but then once you were over that there wasn’t too much climbing to worry about. Sure enough, the trail kept going up but it was fairly gentle with a few sections of climbing over loose rocks that reminded me of the Greenbelt trails I’d ridden. When I got to the top, I was surprised to discover that I’d climbed the trail known as “Fat Chuck’s Demise” which is considered tough enough to have a whole race, “Fat Chuck’s Revenge”, named after it. This filled me with confidence and I went after the next section of trail with as much vigor as I could muster. Turns out that wasn’t a great deal of vigor. Rocky Hill has very tight, technical trails through pine and oak woods over sand, sandy clay, and some loose rock. The route we took through the trails was long but avoided most drops and other big technical sections for rider safety. I’m not good at big drops and scary technical stuff so this was good for me. Still, I hadn’t been on a mountain bike in nearly a year and while I found these trails easily rideable, in contrast to the rock gardens, climbs, and scree-filled descents you can find off the Greenbelt, I could not find any speed. I could pedal through turn after turn, get up and down the little dips, negotiate roots and small drops, but I couldn’t put any sections together to carry speed down the trail. I enjoyed the trail at first, reminded by the surroundings of the trails I used to ride in Florida when I first started riding a mountain bike in the late 80’s. But after a while the endless switchbacks started to get to me. Turn, turn, turn, turn, dip, turn, turn, turn, dip, turn, turn, quick bump, turn, turn, turn, squeeze through a gap in the trees, turn, turn, turn, turn…when does this stupid trail end?!? (This video should give you an idea of what it was like) Every now and then I’d see another rider through the trees, but even when I caught up with someone if they got 20 yards away the trail was so twisted they’d just disappear. At one point I was riding with 3 others, following a woman who was picking good lines and going as fast as I could. Following her lead I was able to ride more efficiently and put some sections of trail together instead of just grinding from turn to turn. Unfortunately, I came up to a root-strewn drop on a bad line and had to put a foot down before proceeding across the obstacle. That little hesitation was all it took to lose her and get passed by the others. I never caught back on. After a while the sun managed to finally burn through the clouds and we were treated to an absolutely beautiful day, marred only by the constant turn, turn, turn, turn, dip, turn, turn, turn, climb, turn, root, turn, tree, turn, turn, turn of the trail. Everything, from the weather, to the condition of the trails, to the performance and comfort of my rental bike, was just about perfect – but all I wanted was for it to be over and to get back onto the road. Without a camelback it was hard to get a drink, so I fell a bit behind on my hydration and food during this part of the ride. Since I was moving around on the bike a lot and not spending much time in any one position this was ok in terms of cramps, until I miscalculated on an off-camber corner and had to really stretch my leg to put my foot down on a downslope. As soon as my foot hit the ground and took the weight of my body, the whole thing seized up in a firm, solid cramp. I could not move and simply stood there waiting for the muscles to relax a little bit. As soon as I could feel my leg loosen up I started pedaling again, wincing as different muscles complained through the pedal stroke, and rode as hard as I could to flush my legs out. Then I found a place to stop and took on as much water and electrolytes as I could. Time passed. I got more and more fatigued, especially in my forearms, from muscling the bike around corners and over bumps, rocks, and roots. I rode carefully and tried to get into some kind of zone as I rolled through turn after turn. As tough as this section of the race was, my mind kept returning to the big hill I’d come down getting into Rocky Hill and trying to imagine how I was going to climb back up it to get home. After a while I realized I was so preoccupied with concern about what was going to come *after* this section of the trail that it was helping me get through what really is the toughest part of the race. Focusing on the climb after the trails meant I could see myself getting through this, despite the unrelenting turns and false hope that would spring up when the trail would briefly hit a jeep road with a sign marked “Home”. Again, I had no idea where I was on the course of how much further I had to go at any given point. All I knew for sure was that I needed to keep turning the cranks, keep from getting hurt, and hope that I was going to make it out before the time cut. I thought about quitting a few times, but since the only way I knew to get back to the checkpoint was to follow the trails as they were marked I just kept on going. I did start to get a little bit angry every time we’d jump onto the road marked home, only to hop off again for a few miles of turns down another section of trail, and then rejoin the road a few hundred yards from where I’d just gotten off. I also had problems with the superior stopping power of my bike’s hydraulic brakes over the wildly ineffective rim brakes on the bike I was used to. Several times I’d approach an obstacle and need to slow down a bit to get to a better line. I’d squeeze the brakes…and come to a stop. After slogging away for hours in the woods I was tired and beat up enough that even when there’d be a decent downhill section I couldn’t enjoy it. I’d have to ride the brakes and ease my way down the hills to make sure I wouldn’t crash out and end up riding the van back to Warda. I really wanted to finish. Eventually I made it out of the woods and back to the checkpoint. It was 1:45. I’d beaten the cut by 45 minutes, but I’d also lost 45 minutes to the time a complete stranger thought I’d finish in. I was so glad to be done with the woods and back on the road. I’d come through it ok, nothing hurt too badly from bouncing over the ruts, roots, and rocks, and I felt a second wind coming on. I got some more food at and drink at the support area. While out on the trails it occurred to me that it might be a good idea to inflate my tires to the max before the final road section to decrease their rolling resistance. By the end of the trails I’d managed to forget to do that, especially after I hear the volunteers yelling, “Here come the sweepers!” as I was getting ready to leave Rocky Hill. To make sure all the riders were accounted for volunteers had ridden out on the course after the last riders to “sweep up” anyone who may have fallen or just fallen behind. If the sweeps were coming out of the woods while I was still there that meant I was pretty close to dead last in this race. Up until now I’d had no idea how I was doing in the race. My goal was to finish, but finishing last never feels that great. I should have spent more time resting up in the support area, but after seeing the sweepers I dropped everything and took off. I asked how much further I had to go. “21 miles, but the next checkpoint is only about 10 miles away.” 10 Miles! I could ride 10 more miles! And 21 miles on the road…well that’s almost nothing! I let out a whoop – I was going to finish. 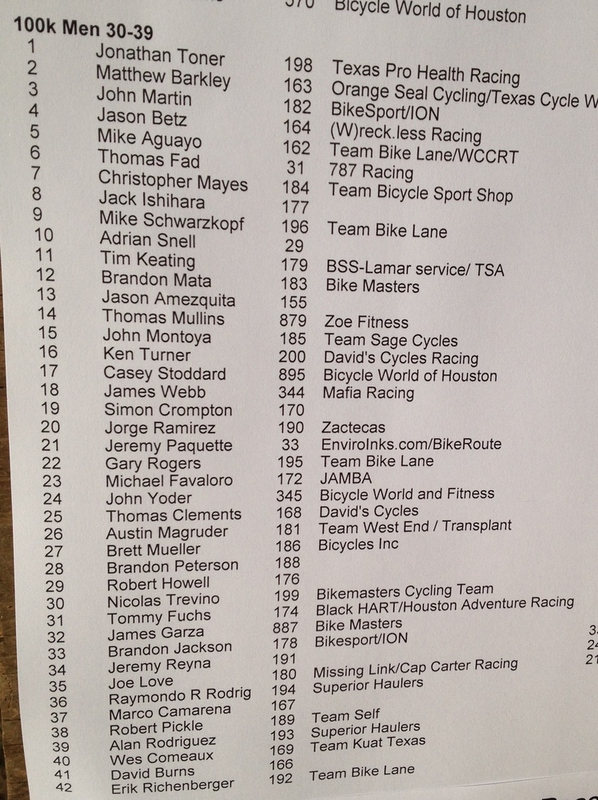 And if I could catch some of the people I saw heading out onto the road I wasn’t going to finish dead last either. First up was climbing up the hill I’d been thinking about most of my time on the trails. As I got onto the road I could see it rising up straight away, a water tower at the top. There were four people already climbing it, which was helpful for me because my lizard brain tends to take over when I have people in front of me and it makes me work harder to try to pass them. Funny enough, the hill didn’t seem nearly as bad looking up as it had looking down. Even though I was tired, once I got on the hill I knew it was going to be manageable so I put my head down and just shifted down a gear whenever my cadence began to slow. I reached the top right behind two of the people I’d seen at the start of the climb. The other two, two women I’d been keeping up with off and on over the trails, had put on a burst of speed after getting over the hill and had simply disappeared. I got back onto the big ring, found a gear and cadence that I could maintain again, and pushed on towards Warda. This was a time that I was glad not to have a computer to tell me how much further I had to go or how fast I wasn’t going, or even a watch to see the minutes tick by. As it was I was now so fatigued that I my heart rate rarely got above 140. I simply wasn’t strong enough at this point to push harder. If I’d seen a computer telling me I was only going 7 miles per hour I think I may have just given up. I kept plugging away and trying to keep eating enough to keep the bonk at bay. Every little bit the road went uphill looked so intimidating that at least once I had to stop and steel myself before trying to ride up a tiny little hill. I think that one may have been maybe 20 feet of altitude gain over 200 yards. Every little extra exertion took a toll, but I was still moving forward and I believed I was going to finish. Surprisingly nothing really hurt that much, given how much had been left to chance with the bike fit and the fact that this was the longest amount of time I’d spent on a bike in my life I felt very lucky. I was tired but I wasn’t in pain anywhere and that was a huge help. Even 30 miles of bouncing over trails hadn’t taken too much of toll on things in the “chamois area”, but I did get a little nervous when I pulled over to the side of the road to relieve myself only to find that I couldn’t. I decided to chalk it up to shyness instead of damage and pressed on until the end (where things later worked as expected). I made it to the final checkpoint and was thrilled when they said it was only 7 miles back to Warda and then one mile on the trail there to the finish. 8 miles. I joked with the other stragglers that at the rate I thought I could go that would probably only take me another 2.5 hours. No one laughed. There was another rider there who was nursing a sore knee. He was angry and hurting, upset that he’d have to DNF for the first time in his racing career. He was young, thin and fit, and I’m sure seeing all the old, heavy riders limping back was adding to his discomfort. I got my final checkpoint marker, double-checked I still had the map we were required to carry, and then headed off to finish the race. 7 miles is about what I ride home from work every day. There was no way I wasn’t going to finish. About a mile and a half from the checkpoint I slammed on my brakes and skidded to a stop. At each of the four checkpoints we had a different colored zip-tie attached to our bike. That way they knew that you’d not taken a shortcut. If you didn’t cross the line with all four ties and your map you would be disqualified. Looking down at my handlebars, I’d only been able to count 3 zip-ties. How? I knew I’d stopped at each checkpoint and I’d watched them all be attached. I couldn’t believe one of them had fallen off, but there was the red, yellow, green and…what was the fourth color? Black. Same as all your cables, doofus. Look closely at your brake cable and you’ll see the final tie wrapped around it next to the green one. Just, turn it a little bit so the tail of the zip-tie sticks out more to make it more conspicuous. I kept riding for home, trying to stay smooth and keep up a consistent effort. I tried to simply enjoy the beautiful afternoon and let the last few miles take care of themselves. Before too long I was back at a crossroads in Warda and headed down the last half-mile of pavement to the ranch. Riders who’d finished long before me were leaving the campground with their bikes on racks. Four or five cars passed me as they were headed out, the closest things to spectators I’d had for the whole day. Not a single one of them waved or honked. “Assholes!” I fumed to myself, “You may have been an hour or more faster than me, but that doesn’t mean I’m trying any less.” Finally, the last car I passed before entering the ranch gave me a little toot of the horn and a wave from the driver. All was forgiven. I looked back as before I crossed the road to the entrance of the ranch and saw that the rider with the hurt knee had decided to tough it out instead of riding in the SAG van and was just catching up to me. I slowed down and waved him past me, telling him I was impressed he’d been able to get back on to finish. He grimaced through the pain and said it may have turned out to be a bad mistake. He was in the Navy and on a short leave home. He didn’t think his command was going to be too happy that he’d gone out and injured himself racing mountain bikes. I rode up the driveway to the ranch, headed for the finishing line at the barn and ready to be done with the day as he rode a little bit ahead. As I got about halfway up the drive a race official hopped up out of his chair and directed us off the drive and back to the trail that we’d started the race on. I asked him if he was kidding, but he said it was only a little way further and not the whole eight mile lap again. I was skeptical until I saw a junction where we’d turned in the morning. There was tape and logs piled up to keep you from making a wrong turn and the path went around a pasture and up towards the barn. As I got near the finish I turned around and saw that a woman I’d been passing back and forth on the final road leg had caught up to me. I stood up and made enough of an effort to get her off my wheel a modest distance. It was the closest I came to “racing” all day, just enough to have an interval as we crossed the line. There were a few spectators, in addition to the race officials keeping time, right at the finish line. As I crossed the line I stood up, grabbed a handful of rear brake, and slid sideways to a stop. “Dramatic finish,” I said, eliciting a smile or two to complement my own big grin. I’d crossed the line in 7:48:06 and covered somewhere near 85 miles. I don’t actually know how long the course was. It was advertised as a 100K race, but I think that’s just the category and not the distance. The winner finished in 4:29:35, with second place just one second behind, over three hours faster than me. I’ve ridden further, but that’s the longest I think I’ve been on a bike by probably 2 hours. I was 41st in my age group out of 44 that finished. There were 4 DNF’s in my group and my sister insists that those must be counted as well. My goal was to finish, and I did, but being that close to the bottom of the heap dims the light just a bit. But like I said at the start, I really had no business being out there anyway. It was pretty quiet at the finish line. I changed my clothes, packed up my stuff, made note of how many Cliff bars I hadn’t eaten and wondered how that’d come into play the last 20 miles. I called my wife and let her know I was back safe then loaded the bike on the rack and got into the car for home. On the way back I stopped at a Citgo gas station in Elgin and got a fountain Coke and some Blue Bell ice cream sandwiches. The ice cream was ok, but that Coke may very well have been the most delicious thing I’ve ever had to drink in my whole life. Nice race report! Really enjoyed that. And great work hanging in there and getting it done, David. Proud of you. Thanks for taking the time to write this. I will be trying this race for the first time in a few months. I wonder what my experience will be???? Great write-up. Glad you made it all the way back. Rocky Hill can be a real beast. I have locked up with cramps there to the point of falling over…..